The ‘Deus Ex’ Marketing Campaign is Off The Chain! Here is some “found footage” of someone breaking off a guy’s leg and beating him with it. This is the latest in an excellent viral marketing campaign for the video game ‘Deus Ex: Mankind Divided‘, which comes out later this year. The previous video can be seen HERE. This new video is all sorts of cool and has some pretty cool effects for being such a short video that looks like was filmed with an iPhone. The last game of the ‘Deus Ex‘ franchise had one survivor by the name of Adam Jensen, who we hear is set to return for this sequel game. Also, this video give us a link in AugAware.org, which has tons of cool stuff you can search out. I’d say that the mystery man in the video is mechanically augmented and we will soon find out what happened to him. From the video: “The fear over the augmented community has boiled over into the streets, as evidenced by this video footage which shows an argument turning into a brutal fight. 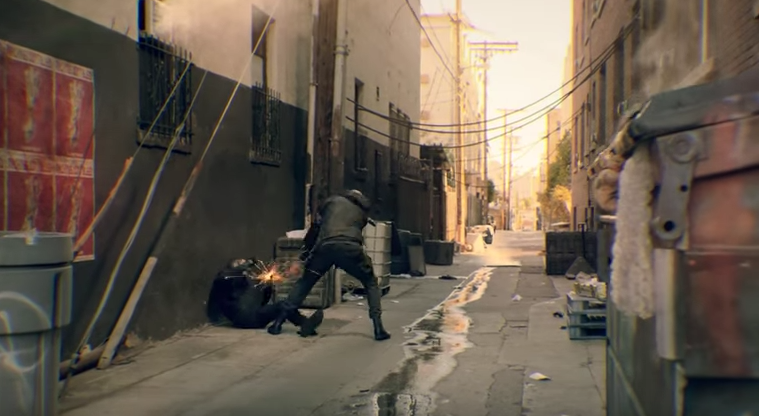 This Viral Video of Surveillance Footage is Quite Good for ‘Deus Ex: Mankind Divided’! New ‘Final Fantasy XV’ Trailer Debuted at Tokyo Game Show!!! There’s a Limited Edition ‘Hitman’ Trilogy Coming Soon to Your Favorite Video Game Console!! Check Out the New Screen Shots from the New ‘Tomb Raider’ Game!!! This entry was posted on Monday, May 23rd, 2016 at 12:30 pm	and is filed under News. You can follow any responses to this entry through the RSS 2.0 feed. You can skip to the end and leave a response. Pinging is currently not allowed. « John Belushi Documentary Is Finally Happening with Showtime!